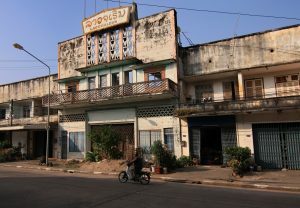 For over a decade, American historian Phil Jablon has been documenting stand-alone cinemas throughout Laos, Myanmar, and Thailand as a window into the cultural heritage of the past. These were previously the centers of communities and represent fine examples of 20th century architecture. Unfortunately, with the surge in multiplexes in the region, local family-run cinemas have nearly died out – taking along the spirit of community that these once created. His goal is to bring awareness to these treasures in the hope that they can be repurposed and used again to revitalize towns. Of the hundreds of cinemas documented by the project, here Phil presents a selection that are easy to visit on your own with Lao Airlines. 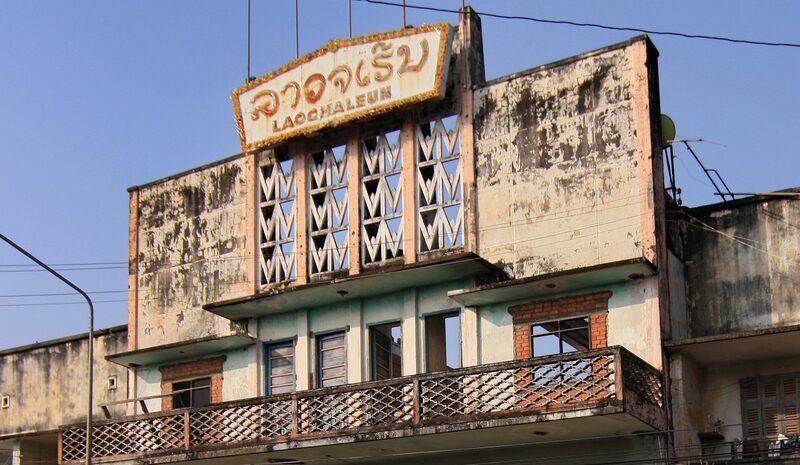 A tourist brochure for Savannaket city dates the Lao Chaleun Cinema to the 1930s. This was the most edifying abandoned theater I’ve found to date. I was told that it was built with the intention of being the anchor for the entire two rows of commercial and residential buildings that it’s attached to, an interesting concept in itself. An entire neighborhood built around a cinema! It is divided into two separate sections. The facade faces onto Kaysone Phomvihan Road, while the main auditorium is in another building in a back alley. A long corridor leads from the front entrance to the auditorium in the rear, while the two sections are connected by a patio bridge. Originally, the capital of Xieng Khouang province was a town called Meuang Khoun, which was destroyed during the Indochina War. 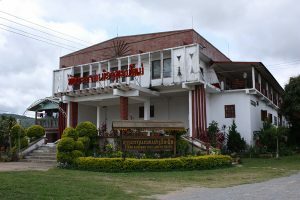 After Phonsavan was dedicated as the new capital in the late 1970s, it was given a gift of the Tolaphap Theater by the Lao Ministry of Culture. The Tolaphap was this remote mountain region’s lone theater from 1983 until it closed down in the early 1990’s. It is now a banquet hall. It was back in 1966 that the Rachinee Theater first opened to the public, under the stewardship of the Sisaleumsak family. The Rachinee stopped showing films back in 1993, after which it was transformed into a karaoke bar for a period. 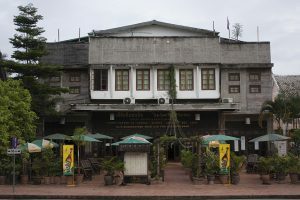 After UNESCO proclaimed Luang Prabang a World Heritage Site, however, the karaoke bar was deemed out of character with the French colonial heritage theme and was ordered to close. The old Rachinee Theater’s most recent incarnation was as the Lao Blossom Residence. Call me naive, prone to exaggeration or whatever you want, but I just can’t help but think that the crown jewel of Apex’s movie theaters, the Scala, ranks among the finest operating movie theaters anywhere in the world. Stand-alone movie theaters of this grandeur are hard to come these days. The financial input they require to keep them running smoothly usually out-weighs the revenue they generate. 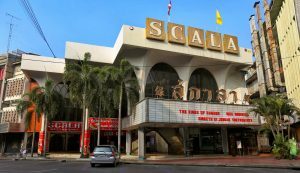 The Scala Theater opened on December 31st, 1969, fully equipped with triple-projection Cinerama, 1,200 seats and the Thai premiere of The Undefeated, starring John Wayne and Rock Hudson. It is currently still in operation, but the lease on the property expires in 2019 and may be forced to close. Also known as the Nang Loerng Cinema, the structure was a two storied wooden building. It had its first screening in 1918. The cinema represented the first time that a motion picture was seen by people in this area, as well as travelers who came to watch movies. In the beginning, the cinema’s seats were long benches without fixed numbers. In the early days it showed silent films. A brass band was arranged to play in front of the cinema to draw the attention of the people. The brass band would move inside when the movie was started. Sala Chalerm Thani was in continuous operation until 1993, when it shut down due to the decreasing popularity of Thai films. One of Bangkok’s ancient entertainment places has come to an end after serving the Thai people for 75 years. Today, the place is used as a warehouse, in ramshackle condition, waiting to be revived again. When approaching the intersection of Chang Klan and Sri Donchai Roads, a sense of loss pervades. Here on the southeast corner of this busy intersection rests the colossal remains of Chiang Mai cinemas. The facade of the Sang Tawan Theater boasted an intricate mosaic depicting Lanna culture. Now it’s hidden from the public eye behind billboards. It is my hope, with enough public support, that the Sang Tawan could be revived and turned into a mixed-use venue, able to accommodate both film and live events, be it concerts, speaking engagements or plays. 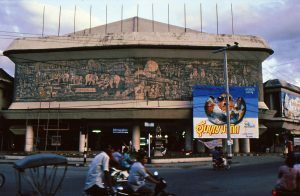 This project is the subject of an upcoming book: Thailand’s Movie Theaters: Relics, Ruins, and the Romance of Escape and a potential documentary. Follow news of the project and learn more about other cinemas at http://seatheater.blogspot.com.